What is the Tire Pros Credit Card? 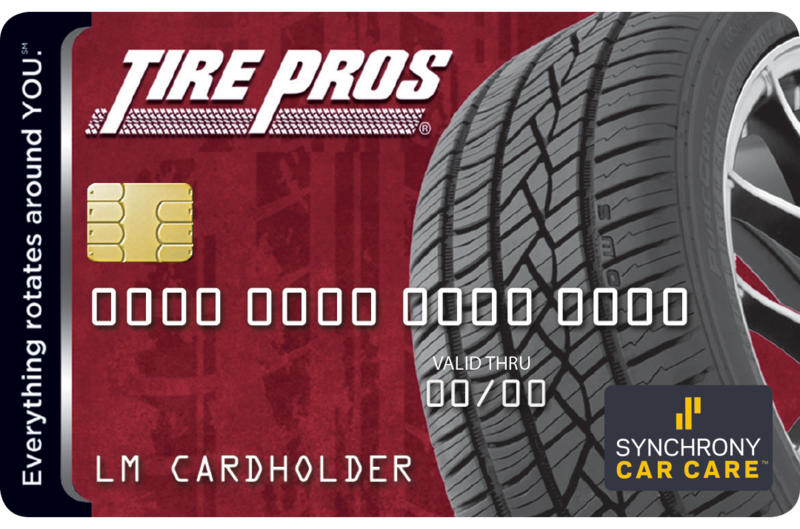 The Tire Pros Credit Card offers customers a credit card through Synchrony Bank with a revolving credit line to use again and again at Tire Pros locations nationwide*. How do I get an Tire Pros Credit Card? You can apply for a Tire Pros Credit Card* online or at any of our convenient locations. How can I make a payment on my Tire Pros Credit Card? Tire Pros offers three convenient ways to pay your Tire Pros Credit Card bill. *Subject to credit approval. Minimum monthly payments required. See store for details. We reserve the right to discontinue or alter the terms of this offer at any time. Credit is extended by Synchrony Bank. You can choose from weekly, bi-weekly, twice monthly, or monthly payment schedules designed to align with your paydays. Whatever works best for you. Pay Over 12 Months : Take time to repay your account over 12 months with payment scheduled to align with your payday. 90-Day Payment Option : Payoff within 90 days and we’ll simply close your account for the amount financed. Early Payoff Discount : Payoff after 90 days and save 25% or more on all outstanding payments.